While many people have been suffering at the hands of the cold weather and icy conditions, our team have been out and about on the roads, bringing luscious plates of food to members of the public. We were in Studley this week providing a hog roast to a young couple who were celebrating their engagement with a winter wonderland themed party. Studley in Warwickshire could not have been more beautiful this time of year and the weather certainly suited the theme! Much of Studley is covered in woodland and this was covered in snow, making the entire place look like Narnia. The River Arrow which runs through Studley had begun to ice over and many birds and ducks were tentatively making their way across it. It was a lovely place to visit during the snowy weather. When hog roast Studley were originally booked to cater for the couple’s party, the plan was to provide the buffet in their back garden. However, the wintry weather meant that many people were reluctant to venture out into the snow and it was also very very cold. As usual the steam rising from our gorgeously roasted hog was visible but so was our breath! Our Taste the Cracklin team didn’t want to disappoint the blushing bride to be so we served both outside and inside despite the weather conditions. The snow did hold off although the weather was bitter and hats, scarves and gloves were required all round. The fiancé had ordered light up reindeer for the scene and fairy lights twinkled from every tree making the evening truly magical. The tables had been covered in glitter confetti and white lace tablecloths. While the beauty of the wintry scene was outstanding, it was with much regret that the party moved indoors towards the end of the evening to enjoy a warmer venue. We could still see the snow from indoors but paper snowflakes were stuck onto the windows for an added touch. Despite the change of venue (which seems to have been a running theme this week), the hog roast hire Studley team still provided an outstanding fare. The young couple had opted for our party menu 4 and had chosen the hog roasted pig, which is one of our favourites. The apple sauce was exploding with flavour and the crispy crackling was the perfect topping. Even our salads went down a treat despite many people wanting something warm inside them! Our party menu 4 gives you the option of three different salad choices so that there is plenty of variety to accompany your gorgeously roasted meats. The couple also chose the warm new potatoes in herb butter which were just perfect for the cold weather. When choosing the menu, the couple had appreciated the number of different options they could choose from and were surprised that, although our speciality is roasted meats, we offer so much more. We can even provide a vegetarian alternative which is just as delicious as our hog roasts! 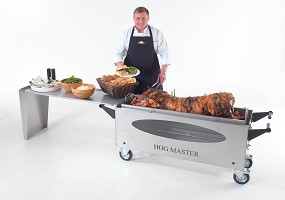 The engagement party was a lovely catering opportunity for our team but while in Studley, we also delivered one of our hog roasting machines which is becoming a popular alternative to hiring a catering team. Hog roast Studley can offer you the chance to roast your own meat, whatever the occasion. We design and manufacture our machines, which mean they do what you need them to! As well as allowing you to roast your meat, the machines we use have a grill inside (which can also be used for pans for side dishes) so you only need one machine to cook your entire meal! The machine that was used for this event was our smallest one, which can cook a 35kg pig! Of course, the machines aren’t limited to pigs but can roast any meat that you would like to cook, which is why they are such a versatile and essential piece of equipment for any catering event. The lady we provided the machine for was over the moon with our service and our machine and was surprised how easy it was to become her own hog roast caterer! Our service is second to none but we realise that sometimes, there just isn’t the budget to pay for caterers which is why we offer machine hire. Here at Taste the Cracklin, we believe in giving customers the best service for their requirements which is why we are always on hand to help inexperienced hog roast users. The hog roast machine we provided went down a treat and the lady said she would definitely hire one again… another success for our Taste the Cracklin team!